I’ve been craving sour beers lately. I don’t know why, but when I saw the Jolly Pumpkin La Roja, I had to get this Flanders Style beer. Having heard several interviews with the folks at Jolly Pumpkin and their passion for sours, their beers have been on my must try list. An artisan amber ale brewed in the Flanders tradition. Deep amber with earthy caramel, spice, and sour fruit notes developed through natural barrel aging. Unfiltered, unpasteurized and blended from barrels ranging in age from two to ten months. 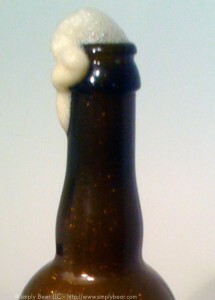 This beer is highly carbonated the foam just keep creeping out of the bottle. In my glass it creates a uber-dense head that actually seems to collapse under its own weight. Great rich ruby color to this beer, It really seems to have picked up some of its color from the barrels it’s in. Did I mention it’s well carbonated. I love that smell of tart fruit and wood. There is no shortage of that in this beer, with a little bit of earthiness to go with it. With the Flanders tradition of making beer, young and old barrel aged beers are blended together to make a batch; this batch was from June 2008. Jolly Pumpkin says on their website that the beer has been aged in oak from 2-10 months. While the aroma was fairly tart, the tart taste was well blended with the oak. Generally aging beer longer in these barrels will increase the sour up to a point. So by blending a newer and older beer you can achieve a desired sourness. I would consider this beer to have a medium level of sour to it, which is wonderfully blended with a creamy ale base and oak. There is some good malty caramel right up front, sour and a bit of spice in the middle and finished wonderfully with good teeth licking sour. My wife had a sip (she liked it), thought it would go really well with apple pie. I think she’s right. Overall Impression: I love sour beers, and this is one of the better Flanders I’ve had. It reminds me of a slight more sour Duchesse de Bourgogne, well balanced and very drinkable. If you like sours try this one, if you want to try a sour for the firs time, this might beer a good one to start with. I hear you on craving sour beers. To me it is such a balanced flavor (sweet/sour). Jolly Pumpkin is one of my favorites. In a month or two they will be opening up their brewery to sell their special Perseguidor. You can only buy it at the brewery on that day. You should try to make the trip! My wife and I can’t get enough of this beer- one of our favorites. If Rodenbach is my benchmark for Flanders Red, I find this hard to compare as it isn’t anywhere near as tart. However, I completely agree that this is a great beer to get started on for someone who has never tried a sour – very approachable and quenching. 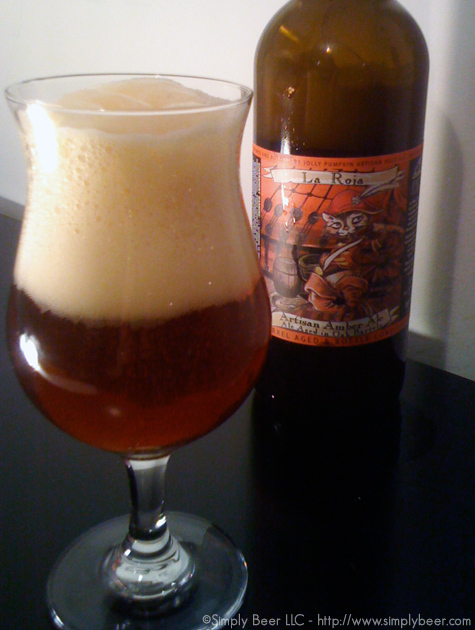 I love the crazy-strong oak character; this beer definitely helped me to recognize and identify oakiness on the palate. @Chris – Sours really seem to be catching on strong or is it because of my new found craving I’ve noticed more people drink and enjoying them? This beer definitely had a good balance of oak to sweet and sour. I blew up Duchesse De Bourgogne in a recent review for being too sweet and fruity. This sounds like it might be a better balance for my taste – I definitely have to check it out. My wife loved the Duchesse and enjoys pumpkin beers, so I imagine she’ll be nuts about this one. Thanks for pointing out another special brew. I’ll follow Chris’s advice and look for this one to try. New style for me! Peter, I love this beer too! I brought some to a local BYOB (Daniel’s Bistro in Point Pleasant Beach…killer!) and was embarrased when the waitress opened the bottle and it foamed over big time! I mean I lost 1/4 of the bottle at least. That said, I found it a great compliment for my meal and have another bottle in stock. This stuff is good! I like sours too, but this didn’t jump out at me as a sour, but I guess it is. Definitely worth a try.